※ English language support: You can check the menu and words into English. 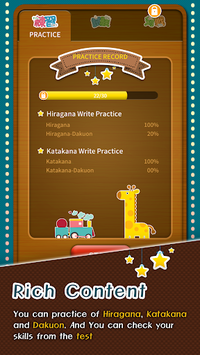 For those who want to learn Japanese, mastering Hiragana and Katakana is the first step, and most important. Hiragana and katakana are the basic alphabets of Japanese based on phonetic characters that represent vowels and consonants. Hiragana and Katakana each contain 46 characters and their pronunciation is the same. However, they each have different applications in writing. 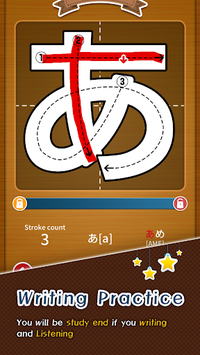 Hiragana appears in every part of a Japanese sentence, and plays many roles. Katakana also has a large role, but not as essential as Hiragana. Katakana is mainly used for nouns that originate from outside the Japanese language, and it can also be used for many adjectives. If you can learn the proper use of Hiragana and Katakana, it will not only improve your comprehension of the Japanese language, but also deepen your understanding of Japanese culture. When you open the app, you will be able to choose either "practice" or "tests"
While listening to the pronunciation, you'll also learn the correct stroke order! All you have to do is trace the screen according to the displayed number of stroke order. Numbers, arrows, grid lines, and various other functions will help you. Once you learn the correct stroke order, you can write the correct form of each character. While listening to the pronunciation, you'll also learn the word! You are able to check your level! 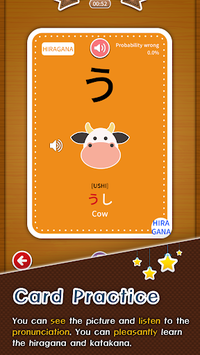 This is the recommended app for Japanese language beginners. - The Online Game Mode tab is open. - The touch recognition range has been expanded to make it easier to write.